Murphy And Casey Play And Sing Bluegrass Song For You - The request usually goes something like this: "I'd like to watch you and Casey pick some songs just for fun. Think you'll ever do a DVD like that?" 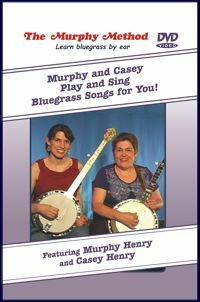 Our first-ever performance DVD, Murphy and Casey Play and Sing Bluegrass Songs For You, features 15 songs, a director's commentary track by Murphy, and bloopers galore. As you will see, we don't always play it right the first time! Or the second time! But we always laugh at our mistakes and try again. Recorded live in the studio with Marshall Wilborn (bass), Tom Adams (guitar), and Scott Brannon (guitar). Question: What's a commentary track? While you are watching the songs being played on screen (at very low volume), Murphy, on a separate audio track, talks about what's going on in each song. She answers questions you might have such as: Why is one guitar capoed and the other not? Why is Casey playing banjo in open D while Murphy is capoed up two frets? How do Murphy and Casey handle the banjo backup?